We’ve picked five of the most innovative names in the interiors and conservatory industries so that you don’t have to. Conservatories are fantastic additions to any home, and drive up the value of your property as well as providing you with extra space. So if you want to make the most out of your conservatory, what should you do? Well, there are some innovative and beautiful products available that will make your conservatory look incredible – both inside and out. So here is a selection of our favourite conservatory products that you should keep an eye out for this year. Some of our best-selling conservatory products, Solarlux windows and doors are set to be just as popular in 2016. Helping home-owners to achieve a seamless boundary between outside and in, these bi-folding doors and glass canopies are sleek and stylish. Due to their minimal design, they fit in well with a number of different schemes – but look especially good in contemporary conservatories. If you’re looking for a stunning design feature for your conservatory, then look no further than Draenert. Somewhere between furniture and art, Draenert’s stone products are mined from the best quarries in the world. Each piece is unique due to the natural patterns in the stone, and can be used in beautiful, eye-catching ways such as a floating staircase. It’s products like this that are perfect if you want to elevate your design scheme to new heights. Another fantastic provider of windows and doors is Internorm. The design styles of Studio, Home Pure, Home Soft and Ambiente cater to schemes from cutting-edge to traditional; so you’re guaranteed to find the perfect one for your conservatory. The variety doesn’t end there either, as their designs are available in aluminium, UVPC and wood too. For the customer that values both creativity and quality, Internorm are the perfect choice. Even the most beautiful conservatory is still just an empty room without the right things to fill it. If you’re shopping for some new furniture, then the award winning Asco-Mobel are the perfect choice. Prioritising both form and function, their tables and chairs are incredible centrepieces in any conservatory they are placed in. Built with the needs of each customer in mind, an Asco-Mobel piece will last a lifetime. Last but by no means least are Markilux. 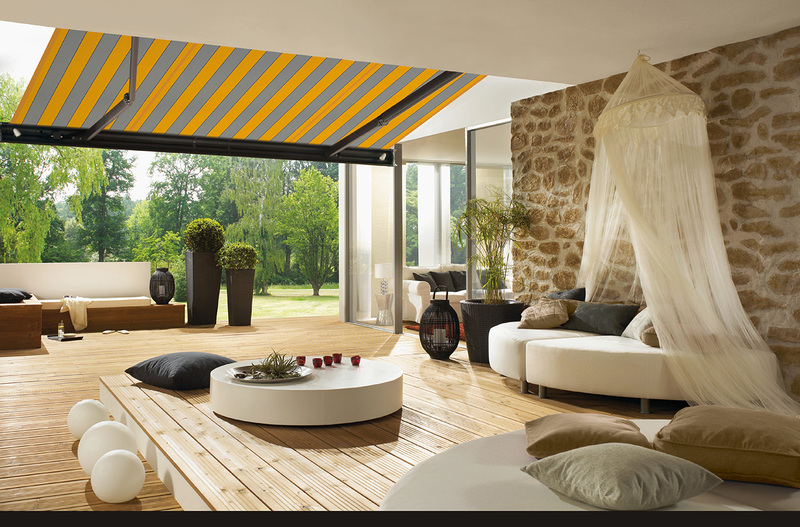 Working in conjunction with Solarlux, they help customers to create beautiful shaded verandas and winter gardens. The blinds are made to order at the company’s base in Germany, and there is a huge selection of fabrics available. These canopies can work in really intelligent ways too. By linking up with a Solurlux system, they can operate automatically, setting temperatures and brightness, and even retracting if the wind picks up. Whether you’re looking to improve an existing conservatory or are planning to add one to your home, any of our top design products will ensure that it’s the best loved room in your home. So go on, give your conservatory the five-star treatment it deserves. We can guarantee that you’ll wow everyone who comes to visit – and you’ll be the envy of all of your neighbours too!